Wi-Fi is a popular technology that allows an electronic device to exchange data wirelessly (using radio waves) over a computer network, including high speed internet connections. 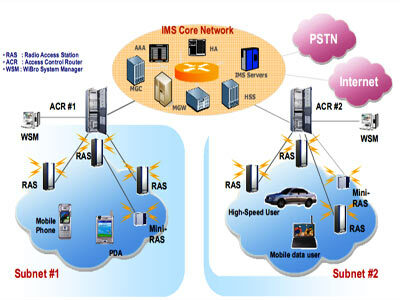 Wi-Fi defines Wireless Local Area Network (WLAN) products. A device that can use Wi-Fi (such as a personal computer, video-game console or digital audio player) can connect to a network resource such as the Internet via a wireless network point. Such an access point (or hotspot) has a range of about 20 meters indoors and a greater range outdoors. Hotspot coverage can comprise an area as small as a single room with walls that block radio waves or as large as many square miles — this is achieved by using multiple overlapping access points. Wi-Fi can be less secure than wired connections (such as Ethernet) because an intruder does not need a physical connection. Web pages that use SSL are secure but unencrypted internet access can easily be detected by intruders. Because of this, Wi-Fi has adopted various encryption technologies. The early encryption WEP, proved easy to break. Higher quality protocols were added later. The Wi-Fi Alliance has since updated its test plan and certification program to ensure all newly certified devices resist attacks. The first Wireless products were under the name Wave LAN. Vic Hayes has been called the "father of Wi-Fi"
To connect to a Wi-Fi LAN, a computer has to be equipped with a wireless network interface controller. The combination of computer and interface controller is called a station. All stations share a single radio frequency communication channel. Transmissions on this channel are received by all stations within range. The hardware does not signal the user that the transmission was delivered and is therefore called a best-effort delivery mechanism. A carrier wave is used to transmit the data in packets, referred to as "Ethernet frames”. Each station is constantly tuned in on the radio frequency communication channel to pick up available transmissions. A Wi-Fi-enabled device can connect to the Internet when within range of a wireless network. The coverage of one or more (interconnected) access points — called hotspots — can extend from an area as small as a few rooms to as large as many square miles. Coverage in the larger area may require a group of access points with overlapping coverage. Outdoor public Wi-Fi technology has been used successfully in wireless mesh networks .Wi-Fi provides service in private homes, high street chains and independent businesses, as well as in public spaces at Wi-Fi hotspots set up either free-of-charge or commercially. laptops that have a cellular modem card can also act as mobile Internet Wi-Fi access points. Wi-Fi also allows communications directly from one computer to another without an access point intermediary. This is called ad hoc Wi-Fi transmission. This wireless ad-hoc networks mode has proven popular with multiplayer handled game consoles. A Wi-Fi signal occupies five channels in the 2.4 GHz band. Any two channel numbers that differ by five or more, such as 2 and 7, do not overlap. The oft-repeated adage that channels 1, 6, and 11 are the only non-overlapping channels is, therefore, not accurate. Channels 1, 6, and 11 are the only group of three non-overlapping channels. Wi-Fi networks have limited range. A typical wireless access point using with a stock antenna might have a range of 32 m (120 ft) indoors and 95 m (300 ft) outdoors. Range also varies with frequency band. Wi-Fi in the 2.4 GHz frequency block has slightly better range than Wi-Fi in the 5 GHz frequency block. On wireless routers with detachable antennas, it is possible to improve range by fitting upgraded antennas which have higher gain in particular directions. Outdoor ranges can be improved to many kilometers through the use of high gain directional antennas at the router and remote device. Simplicity and ease of deployment given that it uses unlicensed radio spectrum which does not require regulatory approval. Cost of rolling out this wireless solution is low. Users are able to be mobile for up to 300 feet from the access point. There are many Wireless LAN compatible products that are available at a low cost and can interoperate with other network technologies. Wireless LAN clients can work seamlessly in other countries with minimal configuration. Designed technically for short-range operations and basically an indoors technology.